The beautiful Bavarian themed town Leavenworth has much to offer in attractions and points of interest. Explore the art galleries and exhibits, enjoy one of the many performances at Icicle Creek Center for the Arts, take in the beautiful scenery at on of the nearby state parks or Okanogan-Wenatchee National Forest. Visit one of the museums to learn about the history of the upper valley or see all the unique nutcrackers. Don't forget about all of the fabulous shopping. Find what to see in Leavenworth. One Mile Loop in the beautiful Enchantment Park. The Icicle Junction Activities Center has fun activities for the entire family including an 8-hole miniature golf course, arcade and game room and seasonal sports court where you can play basketball, volleyball and roller hockey, a 10 feet wide by 7.5 feet tall big screen TV for adults to watch while enjoying a glass of wine or beer and a sports themed snack bar. Pelican Gallery. Located in the Orbertal Mall at 220 9th Street, Suite C, Leavenworth, WA 98826. Phone: 509-888-9696. This museum features over 6,000 nutcrackers constructed from a wide array of materials and designs. Watch a short video to learn the history of this very old and useful tool. Upper Valley Museum at Leavenworth. 347 Division Street, Leavenworth, WA 98826. Phone: 509-548-0728. This former bed and breakfast is a century old building now known as the River Haus and the surround area as the Barb Beach Reserve or BBR. View historical photos of the area, explore the exhibits or shop for a gift on the Plumes of the Past Gift Shop. Okanogan-Wenatchee National Forest. Wenatchee River Ranger District: 600 Sherbourne, Leavenworth, WA 98826. Phone: 509-548-2550. The Wenatchee River District is over 690,000 acres stretching from Wenatchee and the Columbia River to the crest of the Cascades in Glacier Peak and Alpine Lakes Wilderness Area. This area is popular for snowmobiling and climbing. The Alpine Lakes Wilderness offers over 600 miles of hiking trails accessed by 47 trailheads, over 700 lakes and mountain ponds, tree covered valleys, lots of peaks and slopes and the Enchantment Lakes Area home to the excellent rock climbing site, the Cashmere Crags. GORP page on the Wenatchee National Forest featuring articles and advice about this forest. Find information on top hikes with dogs, weekend backpacking trips and wilderness areas. Enchantment Park is best known for it's softballs, baseball and soccer fields. 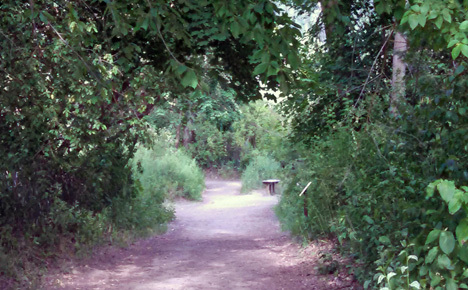 The fields have a direct link to hiking and biking trails that loop through Waterfront Park. Enchantment Trail, Rafters Trail, Bear Trail and Deer Trail lead you through nature's beauty. Enchantment Bridge connects the park to Blackbird Island and the Wenatchee River waterfront environment. In the winter time you can go cross-country skiing on the trails. Other recreation includes skate park and playground. Restrooms and changing rooms are adjacent to ball fields. There is also a parking lot including ADA parking. When you have spotted the gazebo and Maypole, you have found Front Street Park right in the heart of downtown Leavenworth. Here you can relax on the green grass under a shade tree or access the shopping. Many of the festivals are held here including the Christmas Lighting Festival. Lake Wenatchee State Park. 21588 State Route 207, Leavenworth, WA 98826. Phone: 509-763-3101; Reservations: 1-888-226-7688. Access to Lake Wenatchee State Park is obtained by turning north off the Stevens Pass State Route Highway 2, at Coles Corner, onto State Highway 207. It is then 3 miles to the park turnoff. This park is divided by the Wenatchee River into the south park where there is camping, horseback riding and swimming and north park that is one quarter mile walk from the lake. The north park is a forested part of the park. There are over 50 picnic tables throughout the park including 2 kitchen shelters and a playground with equipment. Lincoln Rock State Park. 13253 State Route 2 E, East Wenatchee, WA 98802. Phone: 509-884-8702; Reservations: 1-888-226-7688. Named for a basalt outcropping resembling the profile of President Lincoln, Lincoln Rock Park is located on the east side of Lake Entiat. This park features large grassy fields, children's playground, 50 unsheltered picnic tables, 30 sheltered picnic tables and 3 kitchen shelters with electricity. Interpretive programs are available on most Saturdays Memorial Day through Labor Day. Peshastin Pinnacles State Park. 7201 N. Dryden Road, Dryden, WA 98815. Phone: 509-884-8702. Popular with climbers the Peshastin Pinnacles are a group of sandstone slabs and spires reaching a height of 200 feet and providing scenic views of the Enchantment Mountains, the Wenatchee River Valley and surrounding orchards. There are 5 unsheltered picnic tables. This park has no potable water so visitors are advised to bring their own water. Located just a few blocks from downtown, Waterfront Park is a great place to enjoy a picnic, bird watching or cool off in the summertime by floating on the Wenatchee River. Here you cross the bridge for some peace and quiet on Blackbird Island, or access the Enchantment Park Trail System via River Trail, Channel Trail and Hot Sands Trail leading to Hot Sands Bach and and Enchantment Bridge. The Center for the Arts hosts a wide array of performances, every type of music including opera, classical and jazz, theater, film, lectures and special Christmas programs, sure to please everyone. Leavenworth Summer Theatre. Box Office Phone: 509-548-2000. Venues are Leavenworth Ski Hill Amphitheater at 10698 Ski Hill Drive, Hatchery Park Amphitheater at 7875 E. Leavenworth Road and Leavenworth FestHalle Theater at 1001 Front Street. This portion of the byway travels through the quaint towns of Plain and Peshastin and then through the beautiful Tumwater Canyon with the Wenatchee River on one side onto the Bavarian themed Village, Leavenworth and Cashmere, home of Aplets and Cotlets candy.